Hero Equipment: Update or Enhance first? So apparently the options of Enhancing and Upgrading hero equipment/gear have left some people to wonder whether it is better to first enhance or first upgrade? Does it cost more items to enhance a lvl 10 item versus a lvl 1 item? Or do the Valto runes have less effect on fully enhanced gear compared to non-enhanced? 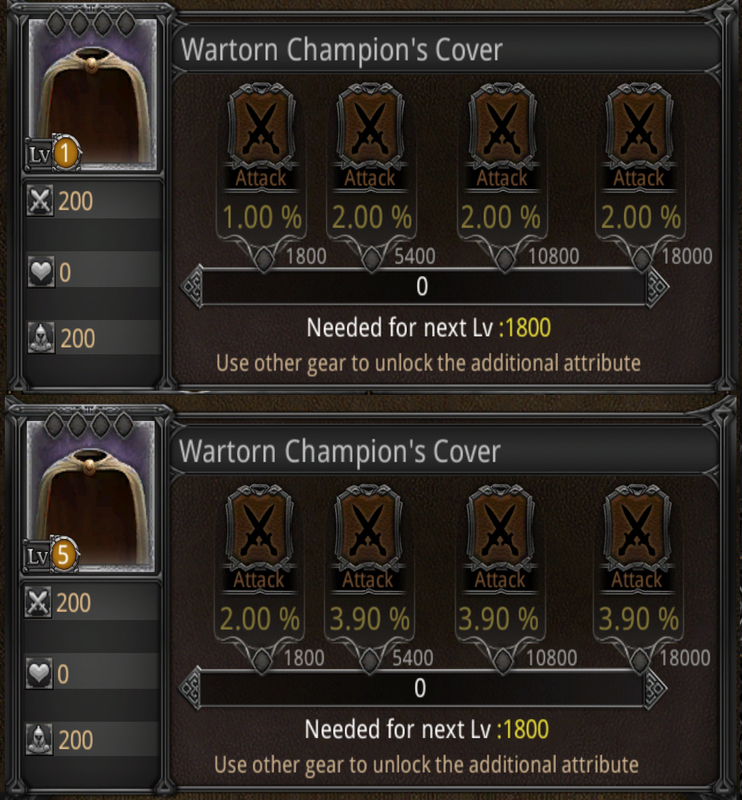 I tested this on two pieces of Wartorn gear, and seeing whether doing one option first meant differences for the second. Results can be seen below the fold, but if you do not need much persuasion, just follow the above answer. So the results are posted below, as you can clearly see, fully upgraded gear needs the same amount of gear-points to be enhanced as non upgraded gear, and Valto runes have the same effect on different levels of enhancement. Case closed, QED. This entry was posted in Articles, General and tagged equipment, gear, Hero, hero equipment, kabam, kingdoms of middle earth, runes, upgrade, valto, wartorn by beardmonkey. Bookmark the permalink. Robert, read artice “Gear bonus attribute levels”. 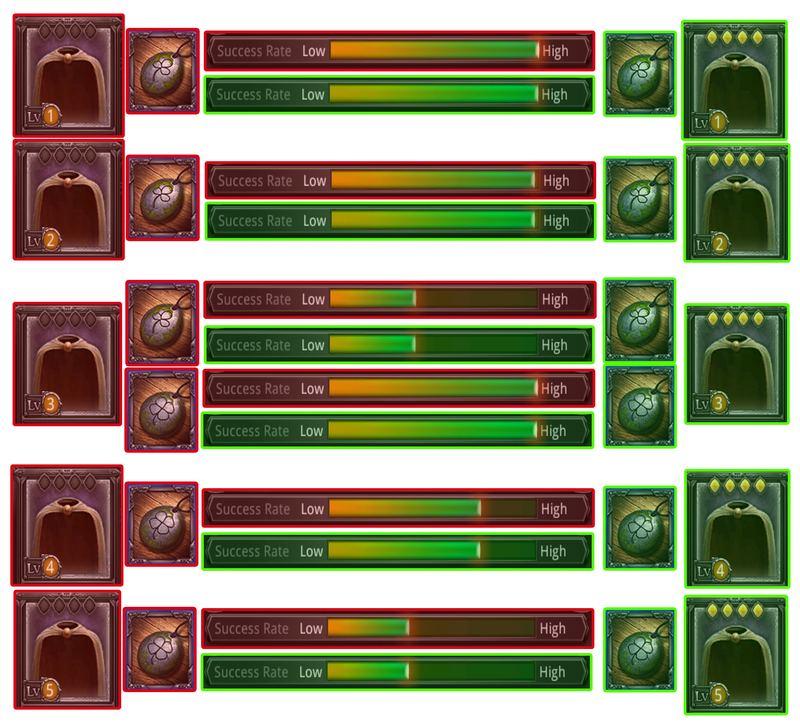 Percentages on gear attributes are fixed and are according to their attribute tier (*1 through to *4) cross referenced by the gear item’s level. For example: *1 attribute on a gear item at level 10 will always be 5%. Nope, never seen it and the numbers dont show it. You tested war torn and another replied his test on higher gear seemed opposite after lvl5 . Would rather enhance so i can use since getting from lvl9 -10 is epic rune intensive and lvl9 buffs can still be better. nice website btw. Really doesnt matter IMO. I usually Enhance gear first before upgrading. With the Necro/Void/Replenishing gear, the same pieces have given me vastly different succes rates in the past. You can get lucky and go from 6>10 with 4 Epic runes (Ive had that), or have bad luck and spend 15 Epics (Also had that). Additionally, when Ive upgraded non-enhanced gear in the past, I got the same results. It is simply a matter of chance. It is the same with Premium, or Smaug drops, or Wheel….you can get lucky or not, but given the small sample sizes you can not say or conclude there is a difference between the situations. Sometimes you flip a coin to get 3x head, another time to get 3x tails. Does not mean the chances were any different in both situations. Only if you CONSISTENTLY get SIGNIFICANT differences between enhanced versus non-enhanced gear in say…50 gear pieces, then the odds favor a different explanation. As I personally have not seen anything near that, Im forced to stick with the original conclusion I made in the article. The answer is yes, if you fully enhance a piece of high lv gear (Wartorn can be powerfull fully unlocked and at lv10, but is looked at as a piece less powerful than most of all other gear, hence it is easier to upgrade it). So back to high lv gear pieces. I want you to take 2 identical pieces of Arcane gear, lets say the sword, and for the 1st one, enhance it to unlock all bonuses when it still is at lv 1. Now go to the second piece not fully unlocked @ lv1 and upgrade it to lv10, and as ur doing it write down how many of which valto runes u used total and how many runes u used on each lv up. I 100% GUARANTEE, when you u go to lv up the 1st piece of gear (That we fully unlocked all bonuses and @ lv1) and do the same writing down how many runes used per successful lv upgrade and the total # of runes used to get the piece to lv10, YOU WILL SEE WHAT IM talking about. lv1-4 upgrades might be the same but when u get higher to lv5-lv10 it becomes almost impossible to get a successful lv upgrade esp when u get to lv7 & lv8. Please see the reply to the comment above this one. Im convinced you are absolutely wrong. First I do not share these experiences on the many pieces of high lvl gear I have upgraded. Secondly, we are working with a sample size too small to draw conclusions from. Like in your comment, you want me to draw conclusions on upgrading 2 pieces of gear?!? A sample size of 2 is 100% inadequate, and I advice to look up the ‘Law of large numbers’ on Wikipedia. What you’re basically telling me is to throw a dice twice, and conclude the results can only be the two numbers thrown, both 50% of the time. And I am telling you that no, we need to throw the dice many more times! Lets throw the dice 10,000 times and you will see, each number is thrown on average 1/6 of the times. But maybe somewhere along the process of throwing it 10,000 times, we throw four times a 6 in a row. Unlikely, but probabilistically speaking possible. Now if you are only around to see these four throws, you might think the chances of hitting 6 are really high, while in fact they are just 1/6. Conversely, you could witness 20 throws in which no 6 comes up, and conclude chances for throwing a six are slim to zero, while in fact they are 1/6. And this: “but when u get higher to lv5-lv10 it becomes almost impossible to get a successful lv upgrade esp when u get to lv7 & lv8.” is simply not true. As I’ve said in the above reply, I’ve had fully enhanced gear upgraded from 6>10 with just 4-5 Epic runes. High level gear (Necro/Replenish). Conclusion: There simply is no possible ground on which to make the conclusions you speak of in terms of gear upgrading and there being differences between enhanced and non-enhanced gear. Does having an enhanced item give you better chance of doing the upgrades?